Favorite thing to make, hands down, is pasta. Maybe because I have such fond memories of making pasta with my family growing up. Or maybe it's about getting my hands in the dough, feeling the ingredients and having the option to make numerous shapes, noodles and ravioli's. 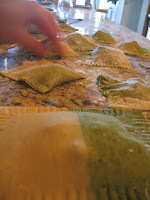 It's also super fun to make flavored dough like spinach, the dough takes on a colored hue to it- green in this case. 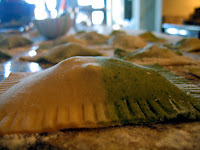 Wanting to vary the look of the ravioli, I made one plain and one spinach dough and then striped the ravioli; it looks so cool and professional! To create the strips, grab one hunk of plain dough and one hunk of flavored dough, smoosh them side by side as you begin to roll into the pasta maker. Continue to roll through the pasta machine until desired thickness is reached. 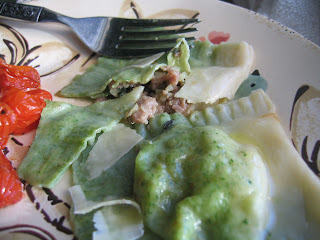 The filling was created to blend with the spinach dough and it works wonderfully. 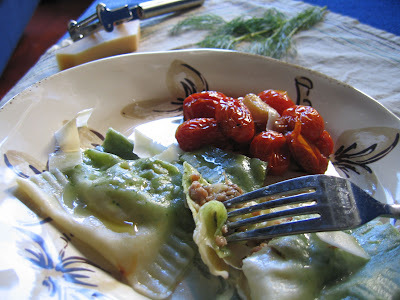 Feel free to just make a basic pasta, and not mix the doughs; look at my pasta posting to find out how to make handmade pasta. Have fun and play with your food, get your hands dirty! See where it takes you! Making pasta makes me fat and happy...how about you? Tips and Techniques: Typically, fillings need a binder like an egg to hold them together. I didn't use an egg this time because I just wanted a looser filling. If you prefer the filling to hold together more, simply add an egg and a handful of bread crumbs to the recipe below. Saute the crumbled sausages in the saute pan, cook until about half way done. Add in the onion, fennel, seasoning salt, red and black pepper until the onion begins to soften. You may need to add a drizzle of olive oil to the pan since turkey sausage can be dry. Add the fresh thyme, fennel fronds and cheese, toss lightly and remove from heat. Cool the filling before stuffing the ravioli. Need the pasta recipe? 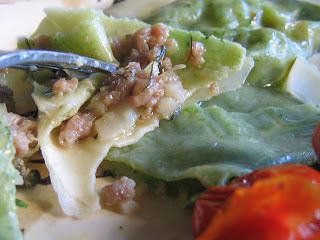 Click here for fresh, handmade pasta.